Growing up as I did in Canada, I took eight years of French, from Grade 4 through to Grade 12. The shameful thing is that I can hardly speak it at all anymore. Classroom french does not truly teach us how to speak the language, and my grasp on the vocabulary gets weaker with every passing year. And don’t even ask me about conjugation, I am all sorts of lost with my French verbs. This is made all the more shameful by the fact that some of my maternal family heritage is, in fact, French Canadian. I even have a distant ancestor, a great-great-grandfather or grand-uncle, who was mayor of Montreal. ‘Tis a sad business, then, that I fumble so badly with the French language. But I CAN make a mean tourtiere! If you’ve never heard of it, tourtiere is a meat pie that is traditionally eaten at Christmas or New Year’s. It’s not made the same way in all places, but it usually consists of ground pork and beef, and is often spiced with cloves. 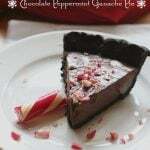 This gives it a distinctive flavour, one I love and will always associate with Christmas. 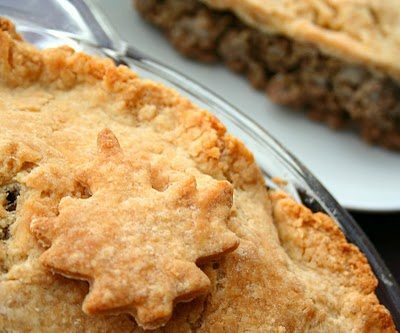 I began making tourtiere as a teenager, when I came across a lovely recipe for it in a holiday issue of Canadian Living magazine. I showed it to my mum and she agreed that we could make it for Christmas Eve dinner, and that was that. We made it every year afterwards, and I believe she still has a copy of this recipe, written out in my sloppy, teenage handwriting. My husband and I have since started our own Christmas traditions, but we do try to have tourtiere some time around the holidays. This year, we actually had it on New Year’s Day. I found a simple recipe on the internet some years ago, when I was an overwhelmed, over-tired new mother, and it’s been the one I’ve followed ever since. Not to the letter, of course, because I never do. I always add more cloves and other spices than the recipe calls for, as I find it really amps up the flavour. I also only ever do a top crust, because I like the meat-to-pastry ratio better that way. And this year, I actually made two tourtieres…one with regular pie crust, and one with a low carb crust made with carbalose flour so that I could fully indulge. The Results: I’ve had this recipe many time before and love it, and this time was no different. For the lower carb version, I wasn’t sure how the carbalose flour would fare when made into pie crust, but I am pleased to say that it held up very well. I did have to add a little more ice water to get the dough to come together, but once it did, it acted just like regular pastry. My husband had a piece of both tourtieres and said that he could barely tell the difference in the crusts. For the record, I have a fear of handling my pie crust dough too much, and thus I usually underhandle it. It results in a lovely, flakey crust that isn’t quite as nice and smooth as I’d like to to be. You can use your own favourite pie crust recipe here, but in case you don’t have one, I will provide you with mine. It’s a combination of a recipe King Arthur Flour and one from The America’s Test Kitchen Family Baking Book and it includes a half tablespoon of buttermilk powder. To make it more flakey, I use a combination of butter and vegetable shortening. It’s delicious! In a large, heavy skillet, brown beef and pork until almost fully cooked. Add onion and garlic and saute until onion is translucent, about 5 minutes. Add water and spices and bring to a boil. Reduce heat to low and simmer until meat is fully cooked, about 5 minutes more. Spoon meat and any jucies into a 9-inch pie pan. Roll out pastry into a 10-inch circle and lay over filling. Trim so that dough overhangs dish by about 1/2 inch, then tuck edges under so that they are flush with the lip of the dish. Flute edges with fingers. Using a sharp knife, cut 5-6 slits in top of crust to allow steam to escape. Bake for 35-40 minutes, or until crust is golden brown. Let cool 10 minutes before serving. Process the flour, salt, sugar and buttermilk powder together in a food processor utnil combined. Scatter butter and shortening over the top and pulse until the mixture forms coarse crumbs. Thansfer mixture to a medium bowl. Sprinkle four tablespoons of ice water over the mixture. Stir in with a rubber spatula, pressing the dough together with the back of the spatula. If the dough is still crumbly and does not stick together, add more water, 1 tablespoon at a time until it does. Form dough into a ball and flatten into a 4-inch disk. Wrap tightly in plastic wrap and chill for at least 30 minutes. Roll out as directed in recipe. *For a low carb version, you can use the same amount of carbalose flour, and a sweetener like xylitol or erythritol in place of the sugar. You may find that you have to use more water to get the dough to come together. This looks so good and hearty. I love "pot pies" or any kind of meat/veggie pie. Your crust looks perfect! Looks like a nice comfort dish! 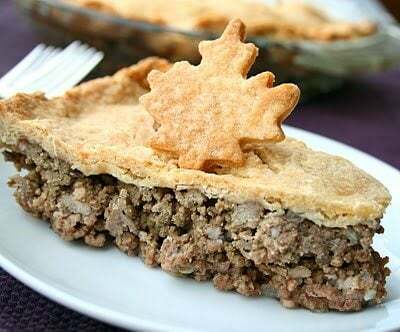 Your tourtiere looks so yummy! I have never made a meat pie before and I'm thinking I need to get to it. Your crust looks delicious as well. Nothing like comfort food being able to be made to suit your needs. Love it! Mmm…I love me some meat. :-p Especially in a pie. Cute little leaf, BTW! I'm so not coordinated like that. Ohh my husband would love that! I'm always trying to think up something new to make for him. First off, I had no idea you were Canadian. Secondly, that tourtiere looks so delicious and the crust is perfect! Love it, Carolyn! Gorgeous! Love the ode to Canada Maple leaf…The spices in this sounds so interesting, my kids would love this! You know the saying, the only language you'll ever need is love? Well, this tourtiere says delicious (in every language) because I can see how much love you've put into it! I too try not to overwork my dough and have tried the shortening trick to make it all light and flaky… So guess where I first learnt how to bake tarts and pies? In France, in the French language! Yum yum yum!!! Meat pies are always great!! Bookmarking this one for the kids! French seems quite difficult, but at least you know more than many. I am sure your maternal family will understand after you served them this amazing dish! Can not wait to try this. The clove in this dish really intrigues me. I eat beef sometimes, but what if I used ground turkey and turkey sausage? do you think it would ruin the dish? It's a pie … made with meat. (Wiping back a tear) You've changed my life today. I was at my father's for Christmas and there was tourtiere on three consecutive night ;). I love the maple leaf you added! This sounds great. My husband doesn't eat beef, though – I wonder if ground turkey would work. Will definitely have to give it a try! Yum! I love a good savory pie! Seeing how food is the universal language of love, I think it's way more important that you know how to make a dish this amazing then it is to conjugate verbs. Just saying. Love the tourtiere, especially the cut-out French flag 🙂 Maybe you can teach me some French so I can communicate with my French family. My hubby and I visited Montreal about 3-4 years ago and absolutely loved it. I was blown away by the food – beautiful markets with wonderful fresh bread and produce. I didn't realise you were Canadian! I love Canada and all things Canadian (well I've never been but hope to some day). This looks delicious, I love how simple the filling is and the flavours used – the sage particularly. Meat pie is one of my kids' favorite meals. 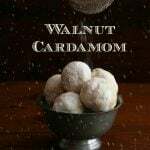 My version uses cloves, allspice and nutmeg. My mom would always have a couple frozen for surprise company. I didn't know it was a holiday tradition. We make it all year round. I still live in Canada, and my French is poor. (Don't ask me about conjugation either. Yikes.) Once in a while we travel to a place where French is spoken, and I'm amazed at my ability to get by and be understood. How pretty! I love the maple leaf garnish! This looks so yummy! I actually baked something similar, but just with some walnuts. Gotta try your savoury version. This is absolutely lovely! I've never had it even though my grandmother was French Canadian. Oh, and French? Not so much. I'm like you about pastry dough, I barely touch it but my pies are the flakiest, lightest things you've ever seen. Such a great recipe! I bet the French would come back far quicker than you think! This looks delicious and so super impressive. I have not made this dish before, and will have too. I love cutting out leaves and things to dress up dishes at the holidays too…my mom did that, or cut up a cucumber and watermelons for fruit bowls. As a french canadian myself , you have a great recipe there. You can use different kind of meat instead of pork and beef. For my recipe, i use 7 different kind of meat. In your post, you forget the soulmate of the tourtière, it's the fruit ketchup. Such a beautiful meat pie Carolyn, love the filling, and the crust. Interesting addition of the buttermilk powder to the crust. We can only get buttermilk powder at our stores during the Christmas holidays, will have to check if they have any more on the shelves. Thank you so much for your kind "shout out" re: my blog! What a stunning meat pie! I also took French during school, and I can't speak a lick of it now. My family's heritage is also French so I'm hoping to learn the language eventually. Thank you for sharing such a delicious recipe. I hope you have a wonderful Friday and a beautiful weekend! Hey Carolyn, this looks delicious. My mother's side is Canadian too and I speak English and Spanish. I can even write in Arabic, but no Francois! Oh well:( Maybe I'll dedicate myself to all of the French's wonderful pastries and cooking too (smile)! 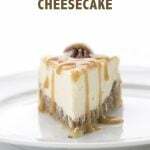 Looks delicious and love the maple leaf on top! I've lived in Quebec my whole life and have never had tourtiere. How sad is that? Yours looks really good. I need to fix this situation! I can't stop looking at this… the crust looks so delicious and flaky. WANT! oooh, I've been craving tortiere for several weeks. Thank you! My dad is Canadian and we have this pie every year for Thanksgiving and Christmas. 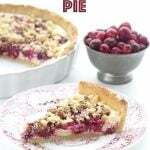 He makes huge batches of 8 -10 pies and they are gone in a flash! Eaten with ketchup (to be traditional) these are delicious!!! We eat a slice for breakfast too. I love the maple leaf on top! Very pretty! Congratulations on getting top 9! That looks tasty and comforting, thanks for sharing! It looks delicious Carolyn! What a perfect dish for this time of year. The crust looks amazing…. I had never heard of this and was curious to see what it was…beautiful! I love your addition of the maple leaf on top too. Congrats on the top 9! I am excited to see your blog, I decided I wanted to try Tourtiere with venison:) This looks wonderful, congrats on your top 9!! French Canadian Tourtiere, sounds delicious, seems similar to a mince pie. The crust looks nice. What a beautiful pictures! This looks so comforting and good! what a beautifully presented dish – I have to say that sometimes (oftentimes) looks are everything and this is so mouthwateringly pretty. Yum this looks awesome. I am going to bookmark it. I have never made anything quite like this. Chicken Pot Pie might be the closest, if that even compares. But this looks deliciously hearty and perfect for these cold days. And, I won some little pie crust decorators in a giveaway recently, so this would be a perfect excuse to use them! 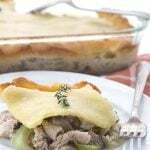 have never made a meat pie – one that is actually all meat – have made the typical 'pot pie' with veggies. your crust looks beautiful too! mmmmm….tourtiere. I had some on Friday and it was divine. This looks like it would sastify my tourtiere craving without running to the local pie shop! Looks divine. Mmm. I like it. And I'm with you on the lanuguage thing, though my classroom French has left me with a huge vocabulary. Even if I don't catch the tenses, I can usually get the ideas! Thanks for a nice post! I've never heard of a tourtiere, but it looks absolutely delicious. I think it's awesome that you were able to make the low carb crust and it turned out so well too. I wonder if there are any language differences between Canadian French and French French. You know? 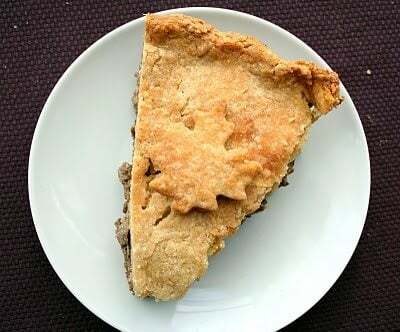 Made your French Canadian Tourtiere tonight – I liked the background information and thought I could make this easily this evening for dinner after a hard day at work. Got everything all browned, spiced and cooked. And my husband rolled out the dough for me – (made with carbalose). 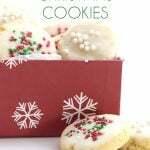 I used butter and canola oil until I got the consistency right – then the ice water. It turned out great! My husband just loved it! So we imagined being French Canadians tonight, listened to Christmas music and enjoyed ourselves! By the way, what is typically served with this? Thanks for the information and recipe. I'm looking forward to getting the book, Low Carbing Among Friends, which I have ordered. I understand it will be here soon. Glad you liked the tourtiere, it's a family favourite. I don't know of anything traditional that is typically served with it. My husband loves his mother's chili sauce, but I have to go lightly on that because it's really sweet and I suspect it's made with a ton of brown sugar! I usually just eat my tourtiere with a big salad. Sweet! I’ve been dying to try a tourtière, and now I can eat one guilt-free! Thanks! 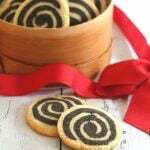 BTW, have you tried un-hydrogenated lard in this recipe? It’s what I use now instead of shortening to avoid the trans fats. I imagine it wouldn’t be too disastrous, being that lard was the shortening of our great-great-grandmothers. I, too, am sorry to admit that I’ve lost a lot of my French, especially as my great-grandfather was born in France. How would you go about freezing this? Wrap it up tightly, and then freeze. N’oubliez pas les”patates! Yes to the ground cloves but you forgot the mashed potato! One needs to thicken the filling so you can cut a slice of the pie. I consider that a lard based crust is traditional(I consider this a traditional holiday item). The original meat was passenger pigeon so ground turkey or chicken would be OK and venison was frequently used. I wrote a paper on Tourtiere in culinary school and it is a quite interesting subject.